Guide Gear High-Back Folding Boat Seat, polymer frame, foam padding, marine grade vinyl, inspected, new. 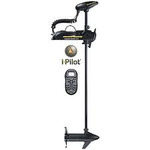 Minn Kota PowerDrive 70 lb i-Pilot Trolling Motor, 24V, 54'' shaft, i-Pilot records and retraces your favorite paths, Spot-lock uses GPS to lock you onto a fishing spot, deploy-assist gets motor in the water, control speed, steering, momentary and constant on/off power with wireless remote, battery meter, Weedless Wedge 2 prop, extra large motor windings, inspected, new. Minn Kota Power Drive 55, 12v, 48'', turns on, needs repair. Guide Gear High Back Fold Down Camo Boat Seat andr Swivel Boat Seat Clamp, polymer frame, compression foam padding, 500 denier Codura nylon cover, inspected, has factory blem open seam.